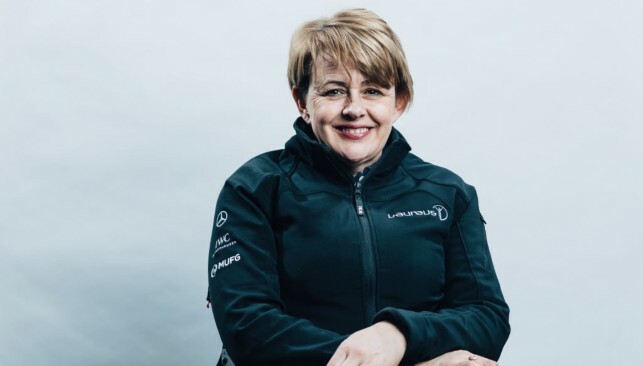 One of the most recognisable figures of the early Paralympic movement, Wales’ Tanni Grey-Thompson continues to expand her influence as a champion for sport, disability rights and social issues in all spheres of life. Spina bifida – a defect of the backbone – never affected her outlook on life as a child growing up in Wales and, by the end of her career as a wheelchair racer in 2007, she had won 17 Paralympic medals and held 30 world records. Grey-Thompson’s stature as a public figure is as powerful as ever since retirement, now wielding a direct influence in British politics as a life peer in the House of Lords. – Won 11 gold medals across four Paralympic Games (Barcelona 1992, Atlanta 1996, Sydney 2000 and Athens 2004). – Was asked by the UCI to participate on a three-person commission to investigate the Lance Armstrong doping scandal in 2012. – One of 66 living ‘sporting legends’ to be a member of the Laureus World Sports Academy, which promotes social change through sport. 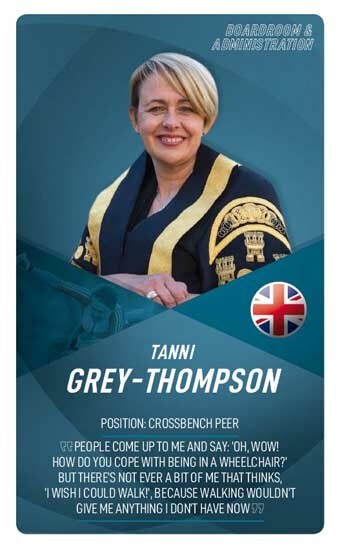 Grey-Thompson’s first name is Carys, but Tanni stuck ever since her sister called her ‘tiny’ after seeing her for the first time. The FA Council has historically been stuffed with ‘blazers’, almost exclusively of one colour, and of an older generation. 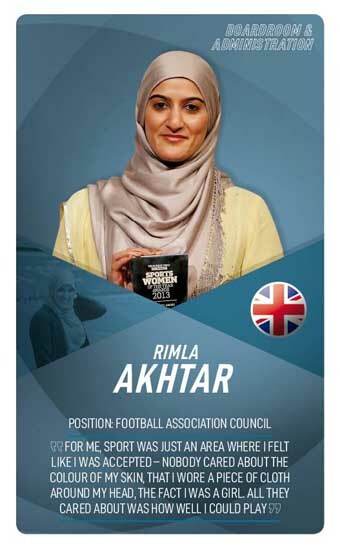 That Rimla Akhtar became the first Muslim woman to take up a seat on a board that drives policy for England’s national pastime is a measure of the influence she wields and respect she commands within British sport. Akhtar fully embraced her Muslim identity in public after growing weary of hiding her true self during an era of anti-Islam sentiment in the mid-2000s. 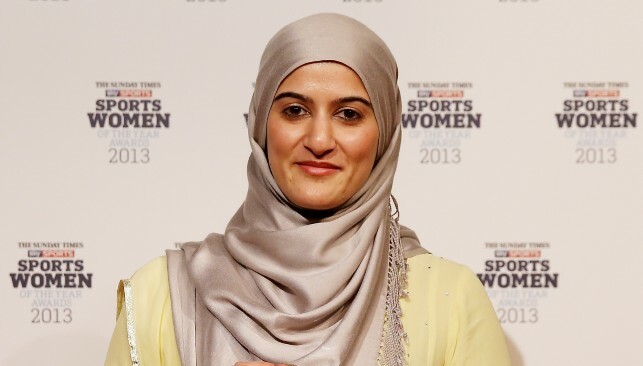 She became chair of the Muslim Women Sports Foundation in 2005 and through their promotion of inclusivity and tolerance, particularly surrounding FIFA’s then-ban of the hijab, the FA soon discovered that Akhtar provided an invaluable voice for under-represented communities. She continues to advise and lead sports groups and bodies, both home and abroad, on issues of diversity within sport. – Akhtar is the daughter of Pakistani immigrants and grew up in London during the 1980s, when racism was rife. – Founder of global sports development consultancy firm, Rhimjim Consulting, having started her career with Pricewaterhouse Coopers. – Among her many roles, is a trustee of football anti-discrimination charity Kick It Out. Akhtar is a gifted sportsperson and has represented the British Muslim Women’s futsal team as captain in a number of tournaments. 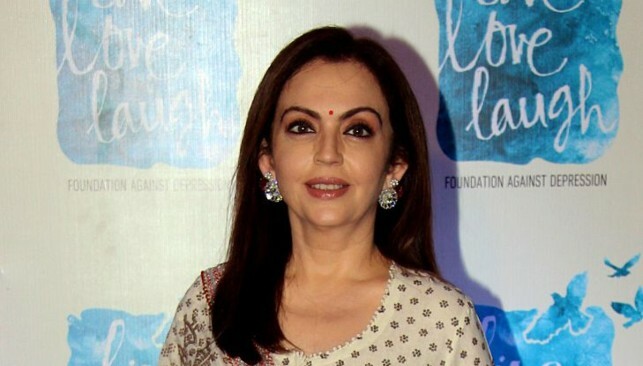 Eleven years ago, Nita Ambani was bidding to become the owner of an IPL franchise. Since then, the Mumbai Indians have won three IPL trophies – and Ambani has become the most influential person in Indian sport. Buying a cricket franchise in India is one thing, but establishing a football league? Ambani founded the Indian Super League in 2014, the most significant development in modern Indian football. It’s seen football’s popularity in India skyrocket – just like she intended. Ambani, and the others in charge of Indian football, have the lofty goal of seeing India qualify for the 2026 World Cup. It’s not impossible: thanks in part to the ISL, the Indian team has shot up the rankings in the last year. But Ambani has even grander dreams. She’s a member of the International Olympic Committee, a role that comes with a holy grail: bringing the summer Olympics to India in 2032. If she can pull that off, the legacy Ambani will leave in Indian sport will be unmatched. – Named 9th in Forbes’ inaugural list of the most powerful women in sport (2018). – Ambani’s Reliance Foundation won the prestigious National Sports Award in 2017. – The Reliance Foundation Youth Sports initiative has introduced sport to 4 million children in the last two years. 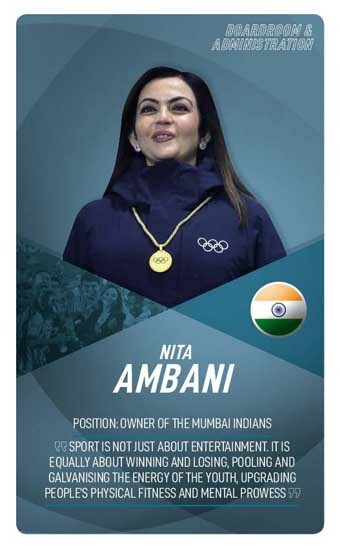 Nita Ambani is the first woman from India to be elected to the International Olympic Committee.